Twenty five years on from the murder of James Bulger, his mother is hoping he will be remembered for a different reason. His name is at the centre of a charity which supports young people who have been a victim of crime, bullying or bereavement. Now, for the first time, a football match will raise funds for the James Bulger Memorial Trust - and a whole host of celebrities are taking to the pitch to help. Our Merseyside correspondent Andy Bonner reports. A legal action brought by the father of James Bulger over the lifelong anonymity granted to killer Jon Venables will go ahead in December. The family of murdered toddler James Bulger are challenging a court order which allows anonymity to one of his killers. The Government have said they will not open a public inquiry demanding answers to how one of the killers of toddler James Bulger was freed. James would have celebrated his 25th birthday last month. Credit: Press Association. The mother of murdered toddler James Bulger has posted a poignant tweet to mark the anniversary of his death. 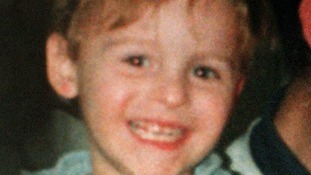 Two-year-old James was abducted and murdered on 12 February 1993 by two ten-year-old boys, Robert Thompson and Jon Venables. Last month he would have celebrated his 25th birthday. In his memory Mrs Fergus, from Kirkby, set up the James Bulger Memorial Trust, a charity which provides free holidays for bereaved children, youngsters who are crime victims or who have done good for others. She's currently planning a black tie and tiara ball to raise funds for its work. Who wants 2 mark James's 25th birthday with us in style u can join us on march 27 4 r black tie an tiara ball, tickets r now available. Mrs Fergus set up a charity in James's memory. Credit: Press Association. A man arrested for allegedly sending offensive tweets about the murder of James Bulger will face no further police action. Sussex Police said the 62-year-old who was held was unconnected to the tweets about the two-year-old murdered in Liverpool in 1993. He was detained at a property in Clinch Green Avenue, Bexhill, near Hastings, East Sussex, on May 22, contrary to the Malicious Communications Act 1993. A police spokesman confirmed that he has now been stood down from police bail and been told officers will be taking no action against him. He said: "Inquiries have now established that he was unconnected with the tweets. No further inquiries are being carried out in Sussex in relation to this matter." The mother of murdered toddler James Bulger has condemned a call to grant lifetime anonymity to killers convicted under the age of 18. A High Court judge has been asked to rule on a submission from a top barrister that children who kill should never be named in the media. Denise Fergus said it was wrong to hand a "get out of jail free card" for anyone convicted of serious crimes. Denise warned that a blanket extension of anonymity could cost millions of pounds a year to enforce. She added: "It's completely unworkable. If a young killer's name was used in a tweet his anonymity would be broken. "They would have to give him a new false identity, like they have with Venables and Thompson. The mother of Liverpool toddler James Bulger says she's angry she's only just been told that her son's killer has been released from prison for the second time. Jon Venables, who's now 31, was freed last week after serving 2 years for downloading indecent images of children. Denise Fergus told the parole board she believed he was still a danger to the public. It's understood Venables is now living under his fourth new identity. Denise Fergus: "I've been walked all over"